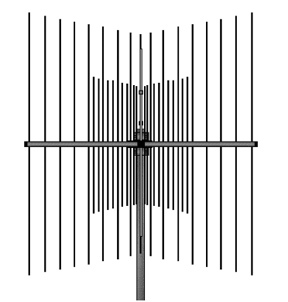 The Arrow CR 146/440 is a dual-band, corner reflector directional antenna covering 144-148 and 420-450 MHz with an SWR of less than 1.6 to 1. 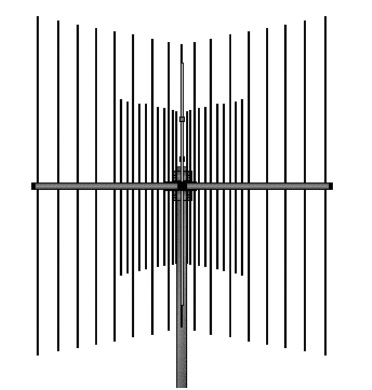 The Corner Reflector design typically gives better performance for packet and high speed data links than long boom yagis even though the yagi has a higher S-reading than the Corner Reflector. The Corner Reflector has less phase distortion causing less errors and fewer re-tries. Frequency: 144-148 / 420-450 MHz. Center Boom: 1" sq. x 35"
Reflector Booms: 1" sq. x 48"
Reflector Elements: 1/4" x 16" / 48" solid aluminum. Gamma Match: Inline, Direct feed - UHF & N connector.